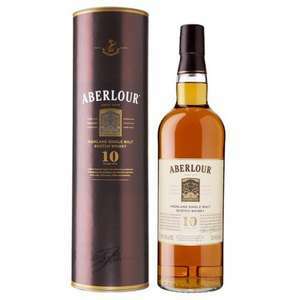 Aberlour 10 years old Speyside single malt Scotch whisky 700ml reduced to £16 at Asda instore and online. Fantastic price for a great malt. Lowest I think its been. Good price but it's not my fave single malt. Got a bit of an odd taste as I remember. This should be so much hotter than it is! I took a punt on the ALDI 18 Year Old for £20, have to admit the Aberlour isn't my favourite but it is a cheap price. Fantastic price for a great malt. Lowest I think its been.Good find, … Fantastic price for a great malt. Lowest I think its been.Good find, thanks. Think it might have even been £10 a year or so ago but I missed that one. £16!! I'll drink to that!!! Good price but it's not my fave single malt. Got a bit of an odd taste as … Good price but it's not my fave single malt. Got a bit of an odd taste as I remember. I just picked up 2. One for my Dad for Fathers Day and one for myself. Just to make sure its good of course! I used to be a bit sceptical about this one, wondering whether the deep discounts seen on this so often were indicative of quality. Not any more - bought one about three years ago and it's been in my regular rotation since then. I've also bought the 12, 16 and A'bunadh. I rate all of them. Ignoring price, I'd pick this before more than half the malts on most supermarket shelves on grounds of taste. The bourbon casks are more prominent than the sherry casks used, and that's not a bad thing here. Makes for a fairly soft but full flavoured malt that ticks a load of boxes for me. It's a total steal at this price. I'll be having some of this. There are also some good offers around on Glenmorangie 10 - criminally underrated in my opinion. For those who might want to straighten out my taste - other regulars for me are Teachers, BNJ, Ardbeg, AnCnoc, Clynelish, Highland Park and Springbank. I've been known to spend more than 10x this price on whisky for drinking. Variety is the spice of life. This deal is, in my opinion, great value for money. I'd feel I'd been treated quite well if I was offered this at a friend's house. Expired. Now up to £27.97.